* Errors And Exceptions In ASP.NET - covers different kinds of errors, try-catch blocks, introduces Exception object, throwing an exception and page_error procedure. * Application Level Error Handling in ASP.NET - goes a level higher and explains handling of unhandled errors by using Application_Error procedure in Global.asax file, using of custom Http modules, sending notification e-mail to administrator, show different error pages based on roles and logging errors to text files, database or EventLog. This tutorial deals with user experience when error occurs. When error is occurred on ASP.NET web application, user will get default error page (which is not so nice looking, also known as "Yellow screen of death"). This error page confuses average visitor who don't know the meaning of "Runtime Error". Although developers like to know many details about an error, it is better to show more friendly error page to your users. - RemoteOnly - this is default value, detailed messages are shown if you access through a localhost, and more general (default) error message to remote visitors. - On - default error message is shown to everyone. This could be a security problem since part of source code where error occurred is shown too. - Off - detailed error message is shown to everyone. When error occured, ASP.NET runtime will redirect visitor to DefaultErrorPage.htm. On custom error page you can gently inform your visitors what happened and what they can do about it. DefaultErrorPage.htm will display when any error occurs. Also, there is a possibility to show different custom error pages for different types of exceptions. We can do that by using <error > sub tag. In code sample bellow, specialized pages are shown for errors 404 (File Not Found) and error 403 (Forbidden). There are different Http codes that your web application could return. Some errors are more often than others. You probably don't need to cover all cases. It is ok to place custom error pages for the most common error codes and place default error page for the rest. Request is not recognized by server because of errors in syntax. Request should be changed with corrected syntax. This error happens when request doesn't contain authentication or authorization is refused because of bad credentials. Server refused to execute request, although it is in correct format. Server may or may not provide information why request is refused. Server can not find resource requested in URI. This is very common error, you should add custom error page for this code. There are different Http request methods, like POST, GET, HEAD, PUT, DELETE	etc. that could be used by client. Web server can be configured to allow or disallow specific method. For example, if web site has static pages POST method could be disabled. There are many theoretical options but in reality this error usually occurs if POST method is not allowed. Web client (browser or robot) could try to receive some data from web server. If that data are not acceptable web server will return this error. Error will not happen (or very rarely) when web browser request the page. This error could occur if web client accesses to web server through a proxy. If proxy authentication is required you must first login to proxy server and then navigate to wanted page. Because of that this error is similar to error 401 Not Authorized, except that here is problem with proxy authentication. If connection from web client and server is not established in some time period, which is defined on web server, then web server will drop connection and send error 408 Request Timeout. The reason could be usually temporarily problem with Internet connection or even to short time interval on web server. This error rarely occurs on web server. It means that web request from client is in conflict with some server or application rule on web server. This error means that web server can't find requested URL. But, as opposed to error 404 Not Found which says: "That page is not existing", 410 says something like: "The page was here but not anymore". Depending of configuration of web server, after some time period server will change error message to 404 Not Found. This error is rare when web client is browser. Web server expects Content-Length parameter included in web request. This is also rare error, especially if client is web browser. Error occurs if Precondition parameter is not valid for web server. This error occurs when web request is to large. This is also very rare error, especially when request is sent by web browser. Similar like error 413, error occurs if URL in the web request is too long. This limit is usually 2048 to 4096 characters. If requested URL is longer than server's limit then this error is returned. 2048 characters is pretty much, so this error occurs rarely. If your web application produces this error, then it is possible that is something wrong with your URLs, especially if you build it dynamically with ASP.NET server side code. This error occurs rarely, especially if request is sent by web browser. It could be three different reasons for this error. It is possible that requested media type doesn't match media type specified in request, or because of incapability to handle current data for the resource, or it is not compatible with requested Http method. This is very rare error. Client request can contain Range parameter. This parameter represents expected size of resource requested. For example, if client asks for an image, and range is between 0 and 2000, then image should not be larger from 2000 bytes. If image is larger, this error is returned. However, web page hyperlinks usually don't specify any Range value so this error rarely occurs. This is also rare error, especially if client is web browser. There is Expect parameter of request, if this Expect is not satisfied Expectation error is returned. This is very common error; client doesn't know what the problem is. Server only tells that there is some problem on server side. But, on the server side are usually more information provided. If server hosts ASP.NET application, then this often means that there is an error in ASP.NET application. More details about error could be logged to EventLog, database or plain text files. 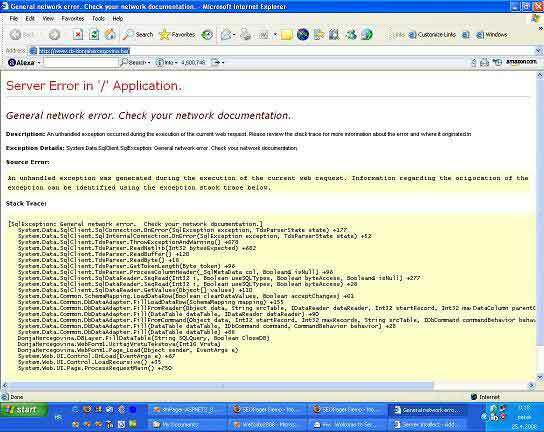 To see how to get error details take a look at Application Level Error Handling In ASP.NET tutorial. This is rare error. It means that web server doesn't support Http method used in request. Common Http methods are POST, GET, HEAD, TRACE etc. If some other method is used and web server can't recognize it, this error will be returned. This error occurs when server is working as gateway and need to proceed request to upstream web server. If upstream web server response is not correct, then first server will return this error. The reason for this error is often bad Internet connection some problem with firewall, or problem in communication between servers. This error means that server is temporally down, but that is planned, usually because a maintenance. Of course, it is not completely down because it can send 503 error :), but it is not working properly. Client should expect that system administrator is working on the server and server should be up again after problem is solved. Similar to error 502 Bad Gateway, there is problem somewhere between server and upstream web server. In this case, upstream web server takes too long to respond and first server returned this error. This could happen for example if your Internet connection is slow, or it is slow or overloaded communication in your local network. Web server doesn't support Http version used by web client. This should be very rare error. It could happen eventually if web client tries to access to some very old web server, which doesn't support newer Http protocol version (before v. 1.x). By using of RemoteOnly value for customErrors mode parameter in Web.config you can get detailed messages when you access through a localhost and custom messages if you access remotely. This could be a problem, because sometime you need to access remotely to web application and still see detailed messages. If you have shared hosting than this is only option. Of course, you still don't want to show error details to end users. If you use some role based security architecture you can show detailed message to single logged user (you) or to all users that belong to some role, for example "Developers". On this way, developers logged in to web application will see detailed error messages and your users will still see just friendly custom notification. By using custom error pages you can achieve more professional look for your ASP.NET web application. Although your visitors will not be happy if something is not working, it will be much better if you told them that something is wrong, but you are aware of that and you will correct it as soon as possible. That will connect you closer to your users. Errors are almost unavoidable, but your competence to deal with them makes difference. I hope that you find this tutorial helpful. Happy programming!